Barbecuing has always been a big enthusiasm for us, so creating a barbecue range designed to make the experience (and the food) as good as it possibly could be, has been a labour of love. Currently, three charcoal barbecues form part of the Everdure by Heston Blumenthal range: The HUB and the FUSION (both featuring an electronic Fast Flame Ignition System); and the CUBE, a portable and compact barbecue-on-the-go (with manual ignition). These barbecues offer speed and convenience, but there are still things for the cook to consider to achieve the best results. Cooking over charcoal is a seemingly simple technique that has been around for thousands of years. For all that simplicity, it’s important to remember that it’s a heat source and that, as such, for the best results we need to consider what is to be cooked and adapt accordingly. So fast-cooking, spit-roasting or gradient-cooking will each require a different layout and management of the coals. Depending on the length of cooking while spit roasting, the charcoal needs to set up accordingly. For very hot coals, place them close together. For cooler coals, place them further apart. And bear in mind you may need a combination of the two and set up your coals accordingly – when cooking a suckling pig on a spit, for example, arrange the most coals at the two ends, as these are the parts (the head and tail regions) that require the most cooking. For a fast sear with a resting period, place the coals on one side of a barbecue (for example, to the front of the HUB, this will create a hot zone faster, and with the cooling rack placed near the back with no coals underneath). In this way after searing, say, a steak you can immediately place it to rest on the cooling rack, where it is no longer in direct contact with the heat. The placement and position of coals can facilitate gradient cooking too. In a barbecue such as the HUB or Fusion, you can set an area of hotter, densely packed coals and another of looser, cooler coals. You can then sear any food on the hot coals, before moving it to the cooler coals; or start cooking on cooler coals before finishing/colouring on the hot ones. 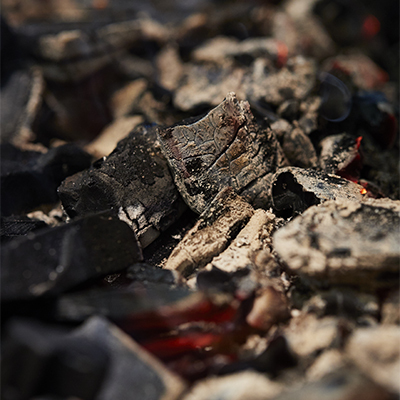 It is always a good idea to prepare coals in batches – in other words, heating and building a ‘reserve’ to one side of the BBQ, so that you can top up or replenish coals as needed. Or, instead of replenishing, you can simply rake the coals to increase the heat. Since ash is a heat-moderator, raking the coals shakes the ash off, gets the oxygen flowing and the heat going. Ash is also a good indicator of when your coals are ready for cooking. After the coals have been heating for a while, they become coated in a layer of ash, giving them that ‘glowing white’ look. And once you see that, it’s time to start slapping some food on the grill!